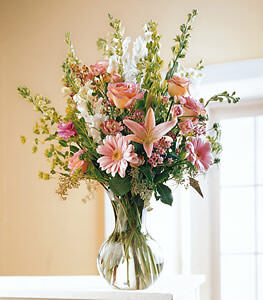 Say Thanks with a bouquet that will make a lasting impression. Beautiful roses, ranunculus, Gerbera daisies, and lilies in shades of pink are complemented by white snapdragons and larkspur. Bells of Ireland and seeded eucalyptus add the finishing touch.